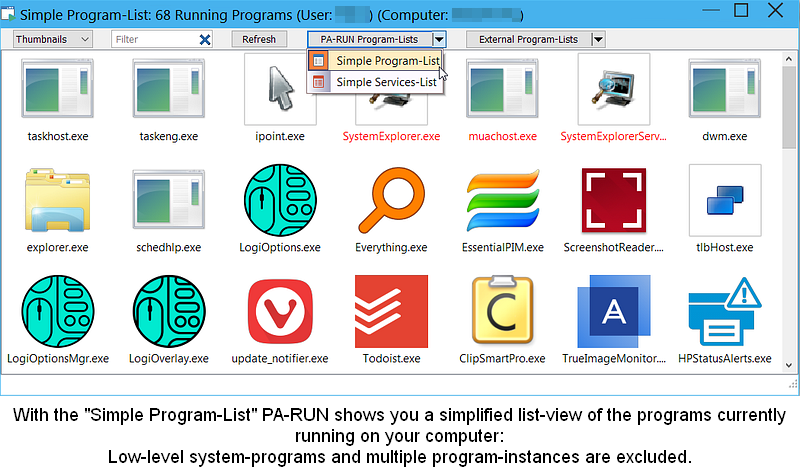 PA-RUN immediately shows 6 different security aspects of any program. 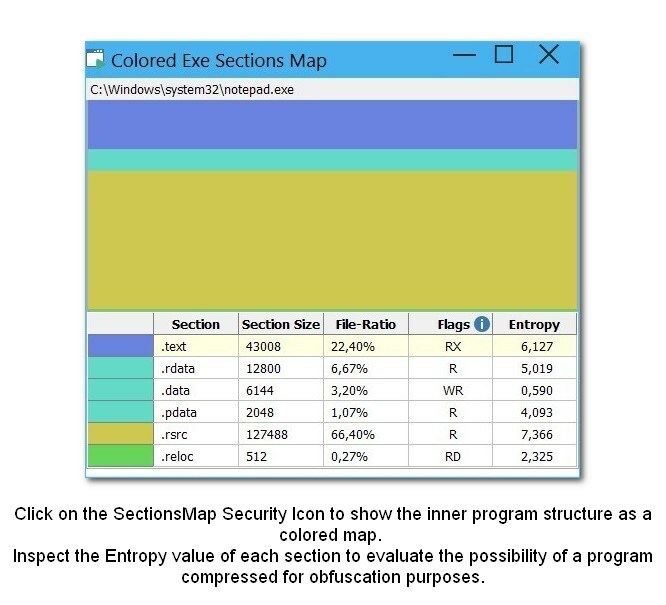 Each Windows program is a black box: You need to know what really is inside each single program. 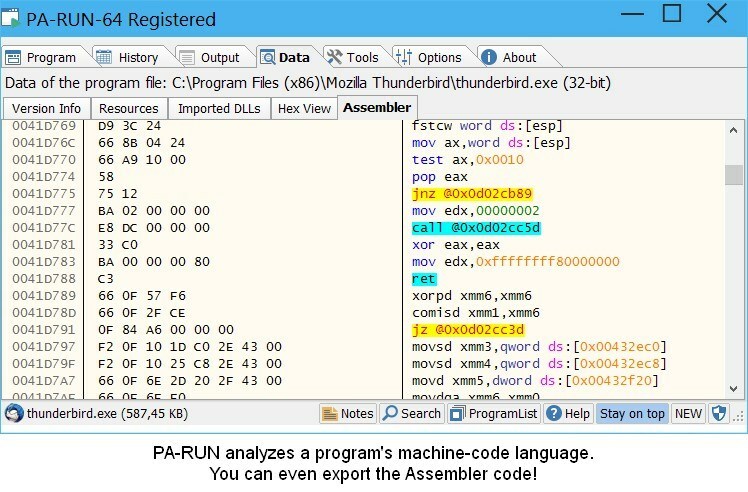 PA-RUN is brilliant also in this field by showing the VersionInfo, the Resources, the imported DLL functions, the Binary View, and even the Assembler (Machine) Code of each program. PA-RUN brilliantly shows what's inside each program. 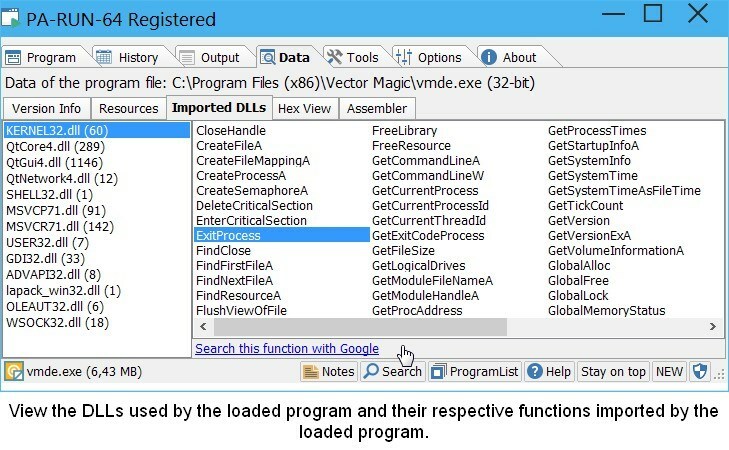 Be productive with programs by professionally creating highly configurable ShellLink-Shortcuts and Batch Files from any program with parameters to easily and conveniently achieve many different tasks. With PA-RUN you can professionally organize your Windows life by easily creating time-saving tasks. This shows only a subset of the features of PA-RUN. Download the trial version to fully evaluate PA-RUN for 30 days for free. Click on one of the smaller thumbnails, then on the larger image to show it in an overlay window. 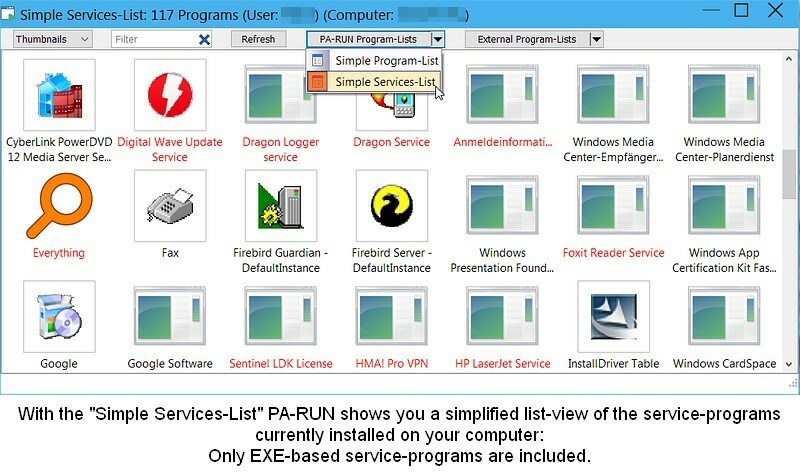 When loading a program in PA-RUN, 6 icons immediately allow you to check or immediately view the security status of the program: Virus-scan, digital signature, exe-compression, colored section-map, firewall-status, autorun-status. (Each can be changed). 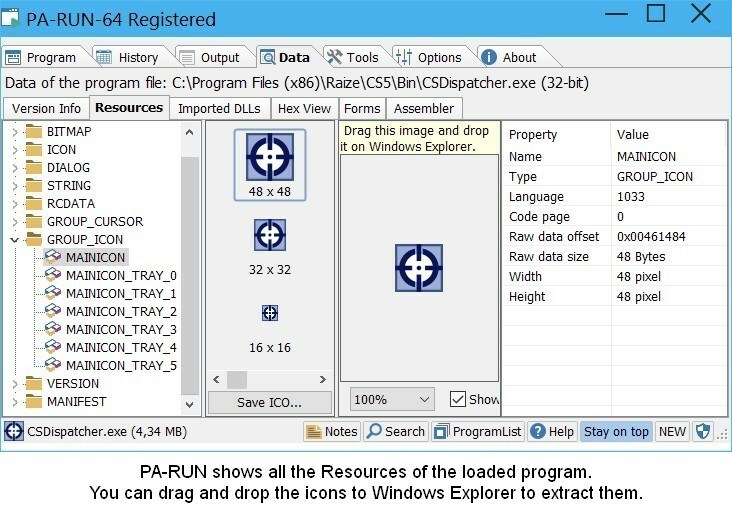 PA-RUN displays the various internal data of any program on different levels. You can easily export these data. 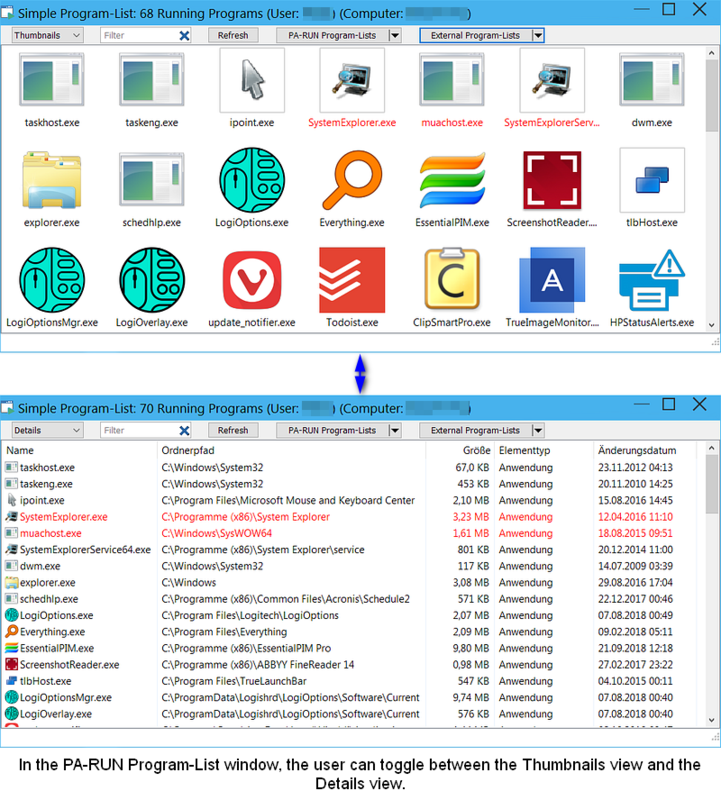 Drag any program/document(-icon) from Windows Explorer, from the Windows Start Menu, etc. and drop it anywhere on the PA-RUN Program tab-page. 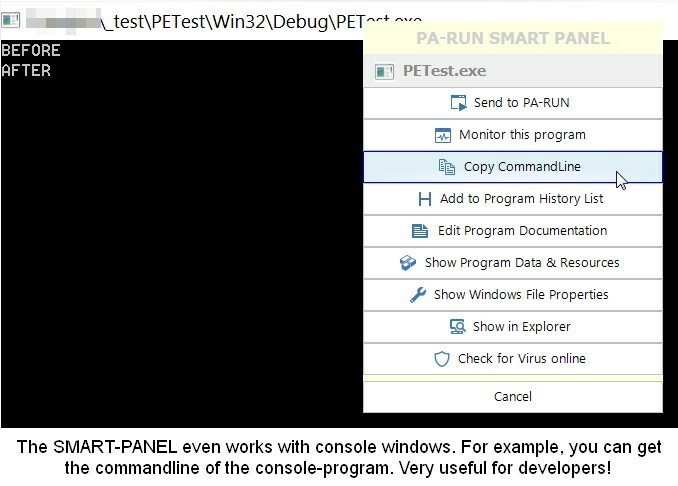 PA-RUN has many options for Console Programs: Capture Output, Hide the console window, Keep the console window open, Run as Administrator. With PA-RUN, you can quickly and easily monitor the performance and the dynamic technical data of any program in REAL-TIME! 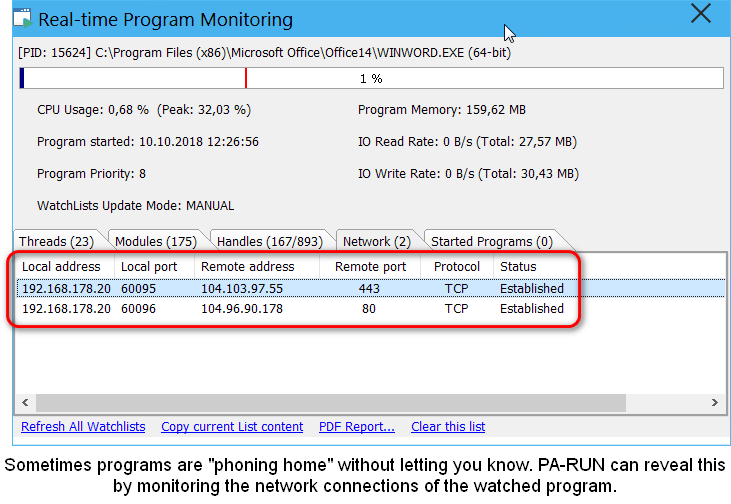 Either automatically monitor a loaded program by clicking the RUN button in PA-RUN or right-click on the title-bar of any application window on your computer screen to monitor that program. 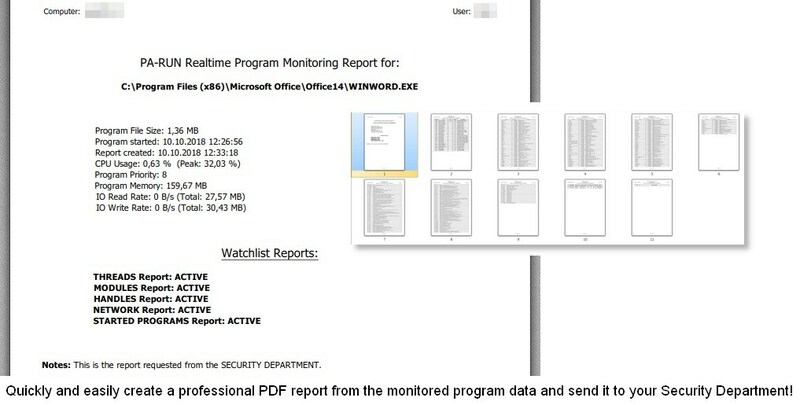 You can even create a professional PDF Report from the monitored data! 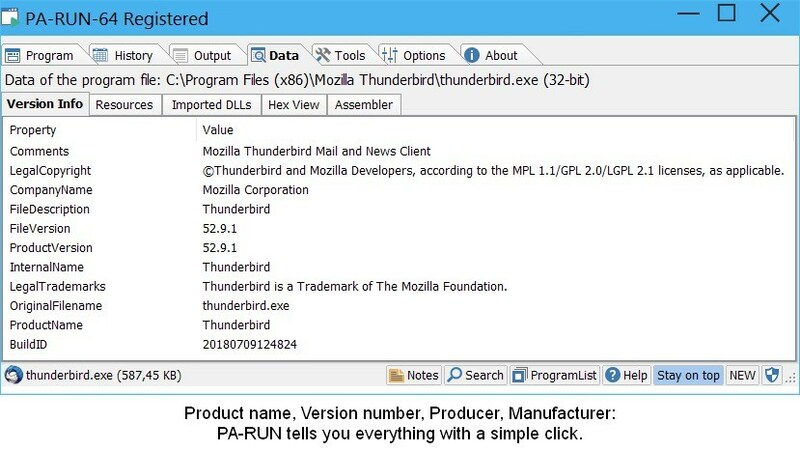 Right-click the title-bar of any application window on your computer-screen and select one of the many useful features of PA-RUN to be applied to the clicked program! Control Type: User-controlled application programs, system-controlled programs (Services), user-accesssible setting-programs (control-panel applets), etc. Programs for specific tasks: Office programs, game-programs, tool-programs (e.g. calculators ...), internet-programs (web-browser, FTP-transfer, cloud-connectors, ...), device-control-programs, etc. Get vast security information about any single program stored on your computer. 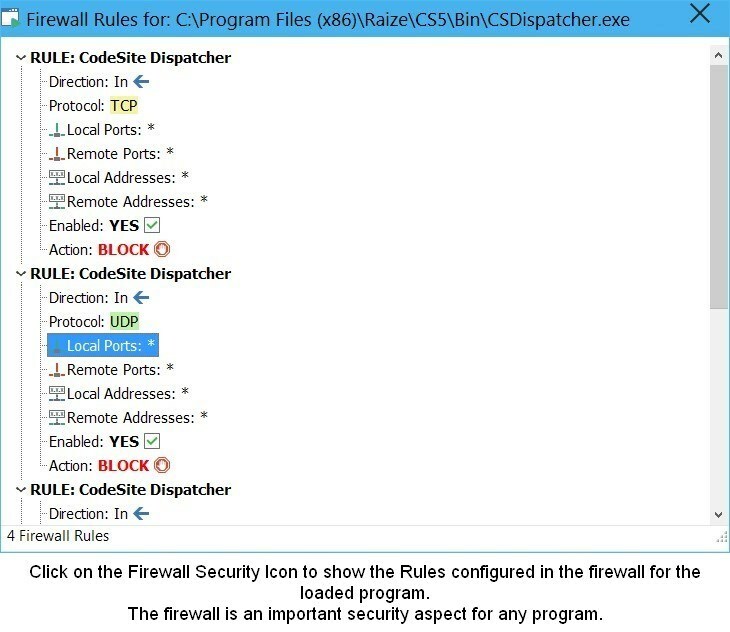 This will allow you to protect your system from malware and intrusions. Get a deeper insight into the inner structure and technical details of any program. 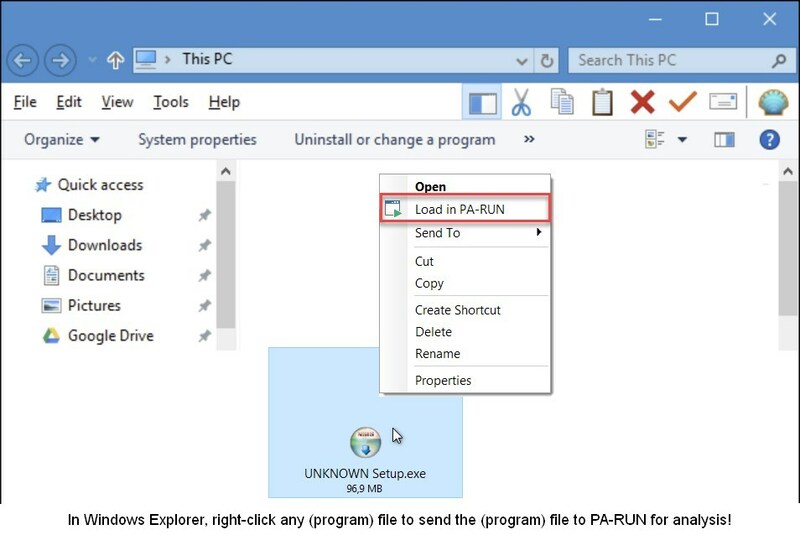 Optimize your system by deactivating unnecessary autostart programs and unnecessary services: The handling of complex settings with PA-RUN is much more easy than with the original Windows tools. 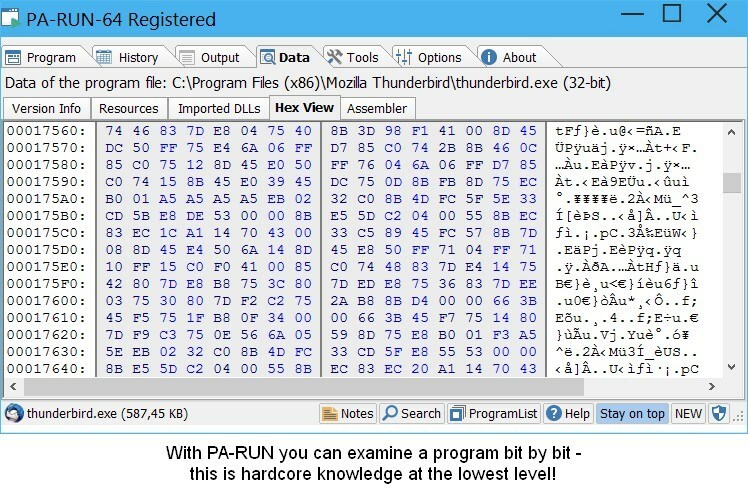 PA-RUN is well embedded into the Windows shell. So you don't have to search in many complex specialized programs: In PA-RUN everything is just one simple mouse-click away. Build a useful personal knowledge database about the programs you work with: Tips and tricks, the program's passwords, serial-numbers, internet-links related to the program, etc.etc. - everything right where you need it. No more searching in distant places which have nothing to do with the program. Test your programs to see exactly how they behave under different conditions. Save money: You don't need to buy expensive programs for things you can easily do in PA-RUN. And last but not least: Working with PA-RUN makes you smile because it's fun! Reproducible bugs will be fixed in the shortest possible time! 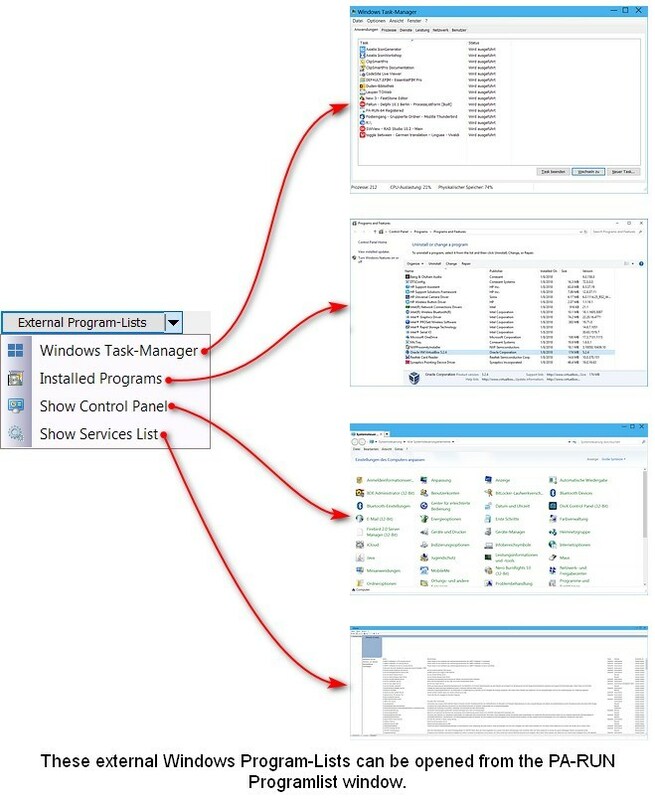 Describe your computer configuration: Go to the About page, open the Info sub-page and copy the computer configuration data. 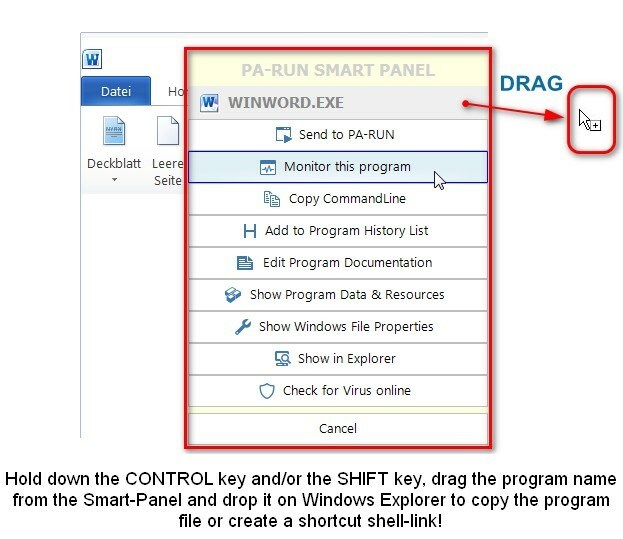 Go to the DOWNLOAD page to download the PA-RUN Setup program or the PA-RUN Portable ZIP archive. Go to the BUY page to purchase a lifetime PA-RUN license for 2 computers for an incredibly low price! The current version of PA-RUN is 1.4.02. At this time no newer versions have been released yet. Here are the features already implemented in the next version or planned for the next version(s). Write to PA-SOFT if you have extra wishes for the Roadmap. IMPLEMENTED: Search with F3 from the "Program watch" edit-field: If you remember only a part of a specific program name and/or program-path, then press the F3 key while the cursor is in the "Program watch" edit-field: In the fraction of a second you get the desired result! 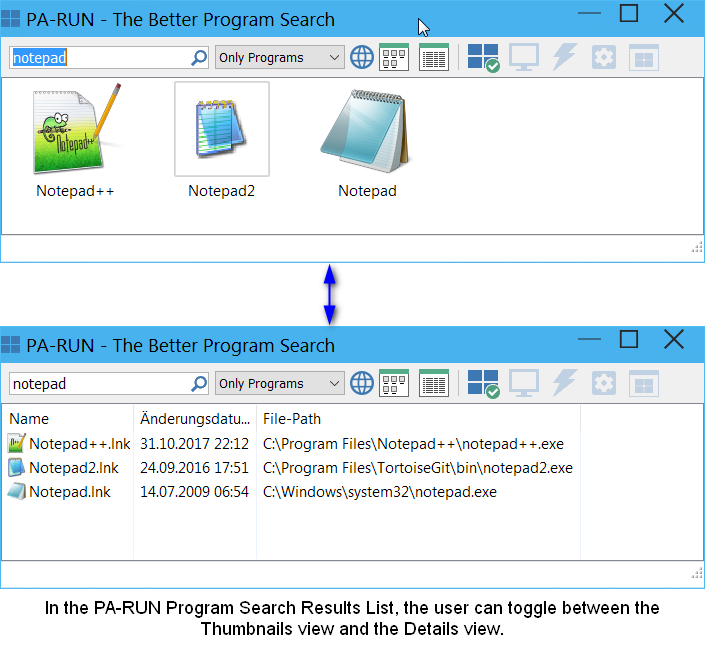 A customer (beta-tester) with Windows 7 said: "I searched for "convert docx to pdf" in PA-RUN The Better Program Search and found 4 programs while the same search in the Windows StartMenu found nothing. That's why PA-RUN is better!" That's why PA-RUN is better! 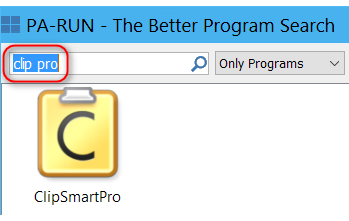 IMPLEMENTED: Search window: If the search was not successful then you can extend the search to the Internet. 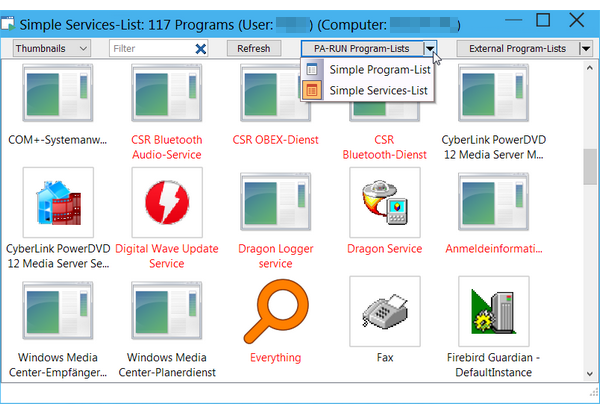 Following the concept of the "Simple Program-List", the "Simple Services-List" lists the essential Windows Services (i.e. 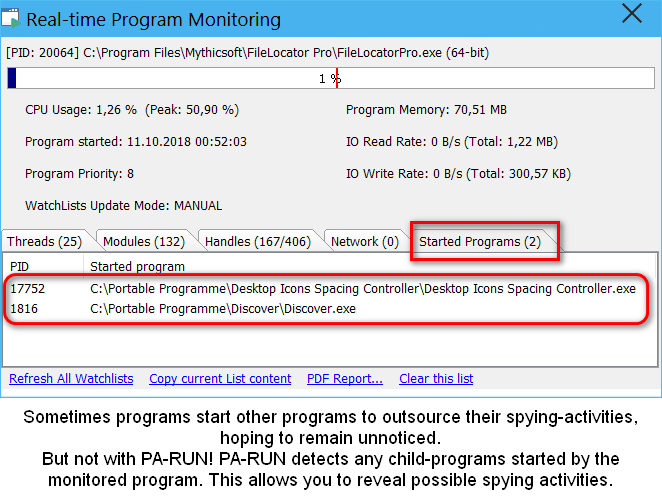 those based on .EXE files) which can be further analyzed by dragging them to the PA-RUN Program page. 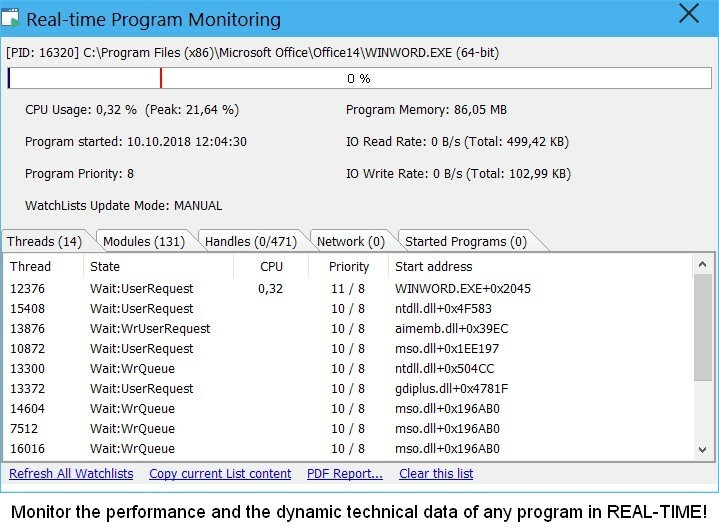 (The Services with the red-colored caption are currently running programs and can also be monitored in real-time). The Watch-List update-mode can be preset in Options/Watch, but often it is useful to temporarily toggle this setting right in the Monitoring window. (In AUTOMATIC mode the watchlists are updated every 1000 milliseconds - which can also be configured in Options/Watch - while in MANUAL mode the user has to click to update the Watch-Lists). 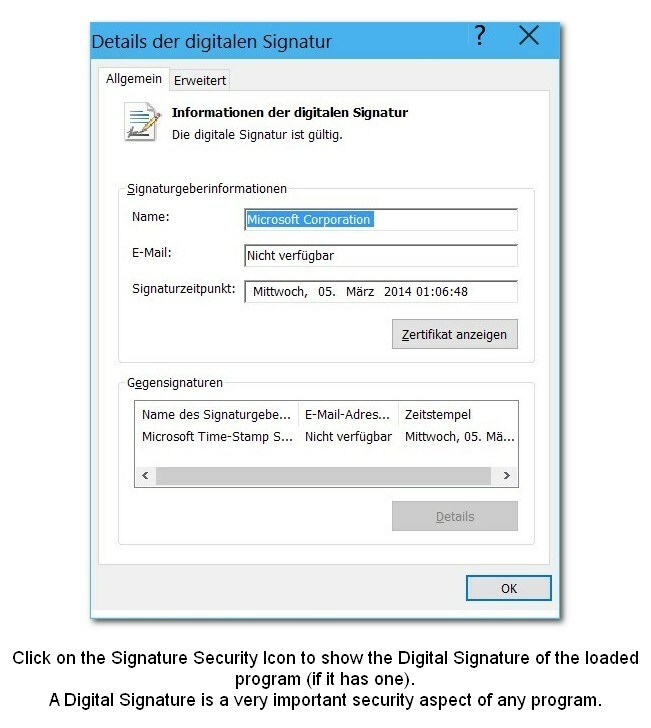 IMPLEMENTED: A Signature for programs you trust (but which don't have a signature): A major step forward in cryptographic technology and its practical application in your security management. PA-RUN can now create a X.509 Public Key Certificate and use it to sign security-checked programs! This allows you to verify if a program has been modified (i.e. infected by malware) AFTER a previous thorough security check (e.g. by multiple AV scanners). Due to the high number of new features the next version-number will be 2.0. 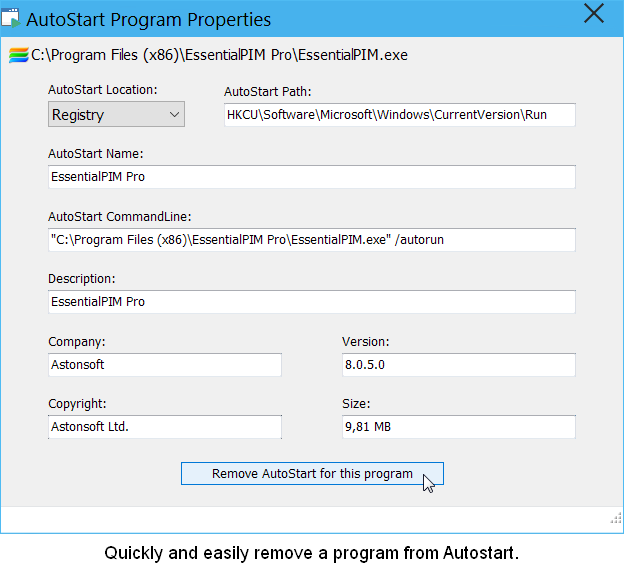 PLANNED: Include parameters when defining (or editing) an Autostart program. 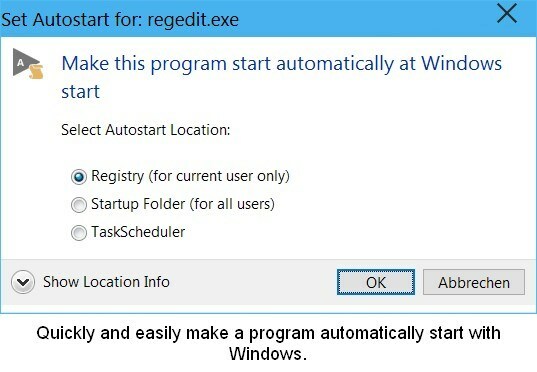 This will allow loading often needed documents at Windows start. PLANNED: Continuous long-term monitoring of multiple programs and automatic sending of the results to a personalized cloud-account.